Latitude: 49.456047. Longitude: -2.653499. At the south-western side of the island of Guernsey and just to the north of L’Eree Bay, stands the well-preserved prehistoric monument of Le Creux Es Faies, a huge grassed-over mound which covers an ancient burial tomb, said to date back to between 3,500-2,500 BC. 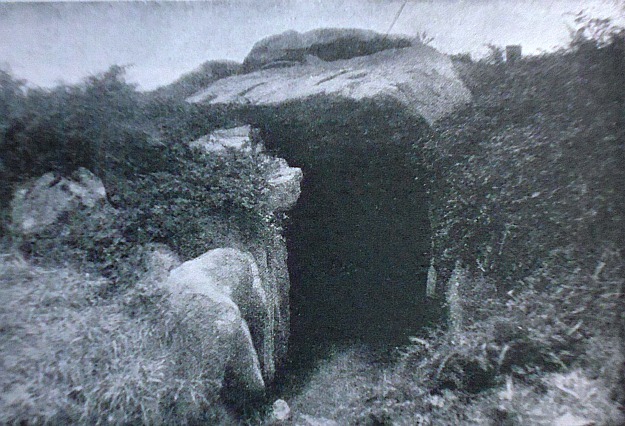 The burial chamber or dolmen is located on the Houmet Nicolle headland a little to the north of L’Eree Bay opposite the island of Lihou, in the parish of St Peter Du Bois, on Les Sablons road. Close by there is a concrete watchtower that was used by German troops during the occupation of the channel islands (1940-45). St Peter Port lies on the east coast about 7 miles from here. On Lihou Island there are some ruins belonging to a Benedictine priory. Le Crueux Es Faies (Mound of the Fairies) is very similar to the La Varde Dolman, also in Guernsey, and to Gavrinis Tumulus, Brittany. The bottle-shaped passageway is said to be between 8-9 metres long and unusually has a chamber that leads off from the main burial chamber (which is round-shaped), while the long gradually narrowing passage has hefty-looking supporting stones along it sides running the whole length into the tomb and, on top of these at one end, two large capstones. The mound at the north-eastern side has been damaged, possibly during the 2nd world war, the sides of the mound are strenghtened by flat upright slabs placed at intervals with a stonework course between each of the slabs, much like at Gavrinis Tumulus. Originally the mound here at Le Creux would have been much higher, erosion having decreased its overall size. The entrance has a huge slab jutting out over it and the approach has large, almost recumbant stones at either side as you descend down into the darkness of the tomb. Le Creux was probably used for burial purposes from the Neolithic through to the late Bronze-Age. In local myth and folklore we are told that the (portal) entrance to the mound is the ‘gateway to the fairy kingdom,’ the inner part of the monument being referred to as a ‘fairy grotto.’ Here the little people would go about their daily duties, making bread and keeping house in their own fairy realm, being largerly undisturbed by the world outside! They would only venture out to play when darkness had descended and be back inside by sun rise. During archaeological excavations in 1840 a number of flint arrowheads were discovered, but little else of interest was found, due quite probably to the tomb being robbed-away by locals or antiquity hunters wanting to make easy money. Newnes Pictorial Knowledge, Volume Seven, George Newnes Limited, London WC2. Categories: Burial Chamber, Dolmen | Tags: Le Creux Es Faies in Guernsey Channel Isles, Le Cruex es faies Burial Chamber in Guernsey | Permalink.